This summer, Caleb Scott will be traveling to the heart of a conflict that has been called one of the greatest humanitarian crises of our time. His goal: to serve the church and the people of the Middle East. Since graduating with his degree in international studies in April, Scott has made a three-year commitment to work at Horizons International, a humanitarian aid nonprofit in Beirut, Lebanon, where he will be working on humanitarian aid distribution and home visitation on their Refugee Leadership Team. It won’t be his first trip abroad or even his first foray into international ministry. As a high school student, he seized every chance to serve people in need. He was left unsatisfied by the short duration of his humanitarian journeys to Nicaragua, Mexico, Hawaii, Belize, Uganda, and Costa Rica and felt moved to pursue an opportunity with a lasting impact. It wasn’t until he launched an exploration of the Middle East—inspired by the locations he first came to know in the Bible—that he became aware of the decades-long discord and spiritual strife that the region’s geopolitics generated. At Pepperdine, Scott followed his heart for service and for the first time saw with his own eyes and heard the stories of locals living in refugee tents. He traveled to places like Turkey, Lebanon, and Greece, where just last year he was part of a team that rescued refugees as they fled their crisis-inflicted home countries. While the experience was fruitful, Scott couldn’t help but feel sadness over their uncertain futures. Scott spent five weeks in that summer before his junior year addressing the immediate needs of the approximately 90,000 refugees in Mafraq. On a typical day he would rise early, load a truck with supplies for new arrivals—mattresses, fans, blankets, gas, stoves, food, and clothes—and make deliveries. In the evening, he would return to a family or group they had distributed to during the day and share tea. As the refugees would unload their experiences to Scott’s imploring ears in evening conversations, the young aid worker came to learn the hard part and real meat of aid work. Scott recalls Nypha, a young widow with two sons. He could barely keep eye contact when she described their daily reality. Just a few months later, as soon as Scott got a break between finals and the start of spring semester, he headed off to the island of Lesbos in Greece with the International Surf and Lifesaving Association to deploy his years of experience as a lifeguard to receive and rescue the raft-loads of Syrian refugees attempting the treacherous maritime winter crossing from Turkey. He actually missed the first two weeks of class, but his professors were happy to assign make-up work in reward. 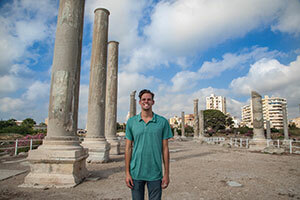 The very next summer Scott began his first experience with Horizons International and focused his attention to working with Syrian refugees making their way into Beirut, Lebanon. The refugee experience is different in Lebanon, while the humanitarian need is just as acute. “The Lebanese government is very unfriendly toward the refugees and have not allowed establishment of a large UN camp like you find in Jordan or Turkey,” he explains. “In addition to smaller, dispersed camps, refugees live in small apartments in the slum areas of Beirut, where you’ll have five families sharing an apartment.